barbie all faces. I hope tu like it .From 1987 to 2012.. Wallpaper and background images in the películas de barbie club tagged: faces barbie. I hope tu like it .From 1987 to 2012. 3 imágenes of Blair from the Trailer = Full Blair! I have found it in Barbie Movies Wikia. Barbie's face of FS freaks me out. God, she looks much older. I love Anneliese's ,Erika's ,Annika's ,Clara's,Rapunzel's ,Liana's ,Corinne's and Genevieve's face.What are your fave barbie faces Adrianna? 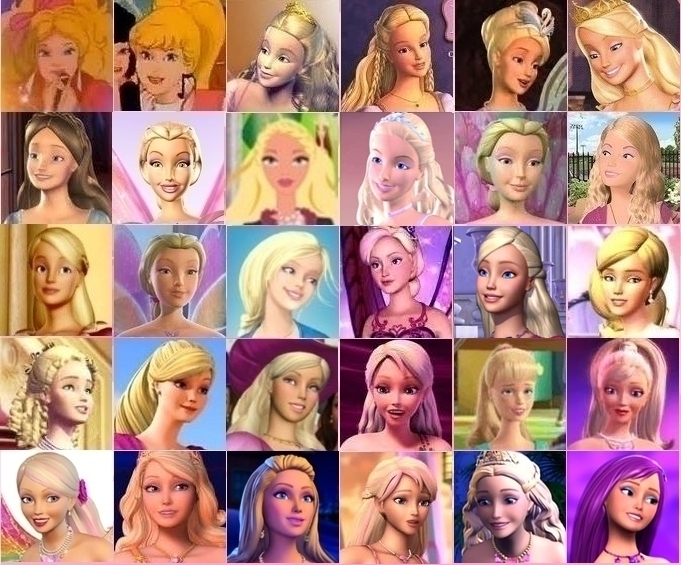 I forget Eliana's face from Barbie Fairytopia magic of the rainbow and odette's face. Easy. Corinne's, of course. She'll always stand out for me. And your least fave barbie face exep the one from FS.My least are BD,FS,FF,Barbie in a Perfect christmas and the first two faces of barbie and the one with my scene .Your's? Yeah, it's only FF and FS. I kinda like Barbie of BD and PC. Well In the last part of the film Barbie's face in PC is cute but in the first part of the film her face don't look good. Nothing bad with FS Barbie's face for me, strangely. Not exaclty bad but the other's are more prettyer. That picture of Corinne is really, really, REALLY pretty. Twice agreed! It's the only one truth. Ro's face is my favorite. My least favorite if Barbie from FF.